Today I received my first Lorac eyeshadow palette. (Cue the fireworks, bells, drums, whatever–I want to celebrate!) I am so excited to finally try Lorac. 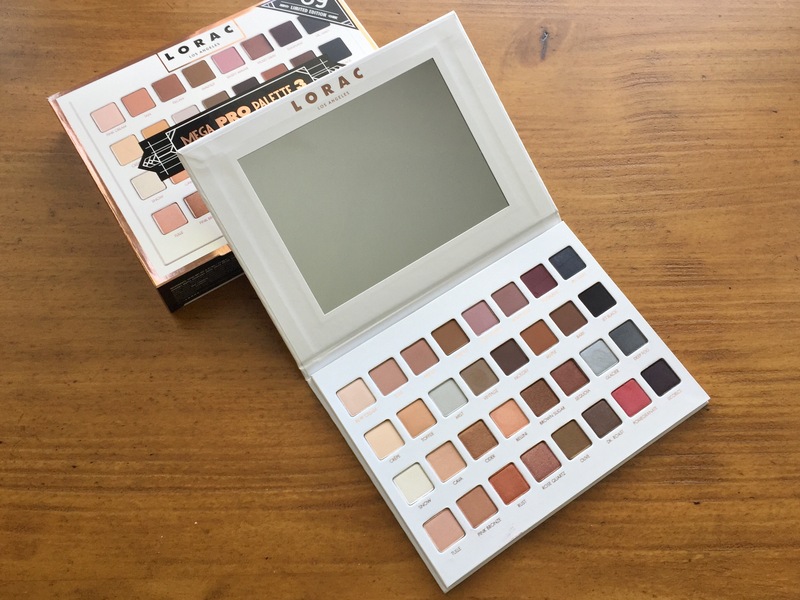 I have heard so many great things about their eyeshadows, but to be perfectly honest, none of the Lorac Pro palettes ever really called to me. I tried to want them, I really did. I heard everyone say how amazing they were, that the shadows were creamy and pigmented and so easy to blend, and I wanted to want them. But every time I saw them I was, well, bored. There were just so many pale neutrals. I want makeup to call out to me, to sing my name. I want to feel a flutter of excitement when I pick it up, that rush of exhilaration when it swatches perfectly. I want to pull open my palette drawer and just smile, knowing that it’s there. Lorac palettes just never did that for me. 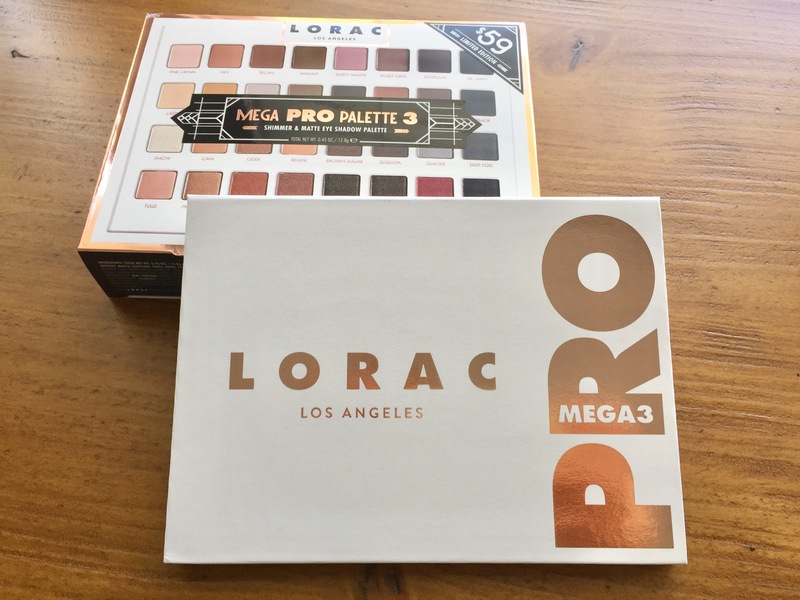 I remember browsing through my Instagram feed in September, then stopping and staring at a sneak peek of the Lorac Mega Pro 3. I was floored. It was that moment in a rom com when the heroine realizes she’s found the one. That she hasn’t been crazy all along because the right one was out there, she just needed to be patient and not settle for one that just wasn’t her type. Of course, all relationships have struggles. We all do stupid things. Like the day I received an email about Ulta Platinum members receiving a one-day early access to the Lorac palette, and I passed it up. “I’ll wait until next month when my budget resets,” I thought. Nevermind that this is what I got Ulta Platinum status for–those early access Platinum perks! I can talk myself out of anything. So the next week I was in a frenzy, trying to find out the release time for the palette so that I wouldn’t miss it. This was my first experience with limited edition makeup drama, and I watched in horror as the MAC website crashed during the release of its Selena collection, afraid the same would happen to the Ulta website. With FOMO in full effect, I checked the website every 15 minutes until at exactly 12:01 am on October 2, I ordered my palette. No drama, no fanfare, but I was so relieved. And the palette is still available on Ulta’s website, so it didn’t sell out as fast as I’d been led to believe. That’s why I can write a review today: you can still get it if you wish, though I’m not sure for how long. I typically write reviews after at least two weeks of trying a product, so I can really get a feel for how it works both on my face and in my life. I am going to put this one up sooner, though, to be sure the palette is still available when you read this. 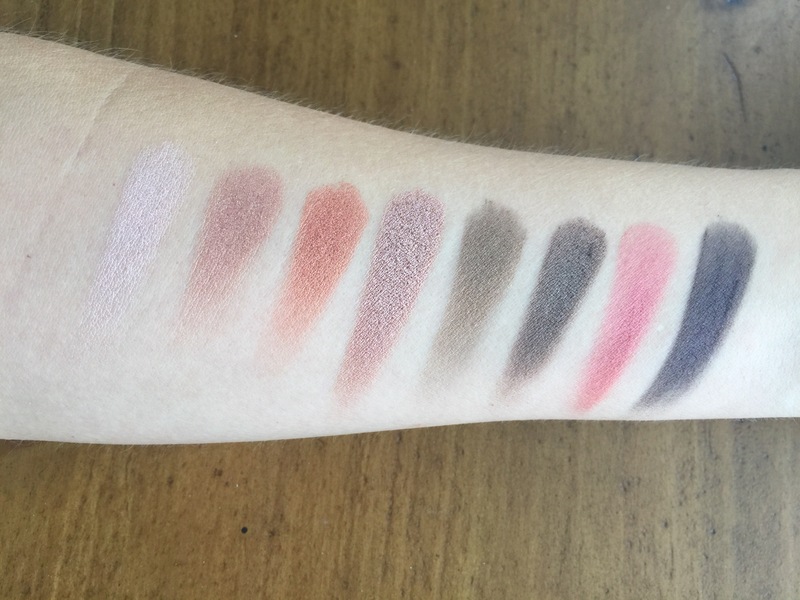 Just know that this is unusual for me–I don’t love swatch reviews because I don’t think they tell the whole story, but unfortunately, that’s all of the story I can tell right now. I have a terrible cold and don’t want to contaminate the shadows by putting them on yet. But scroll down–I think first impressions are enough this time. So first impressions: The palette is gorgeous. Yes, the white packaging will get dirty. But it’s so pretty. And you can wipe it down with a makeup remover cloth if this will bug you (like it will me); just be careful not to get it in the shadows. If yesterday’s blog post tells you anything, I am a sucker for rose gold, so everything about this palette, from the rosy undertones throughout the shades to the rose gold lettering on the case, makes my heart sing. It is part of Lorac’s “Roses and Revelry” holiday collection, and retails for $59 for 32 shades (16 matte, 16 shimmer). It is thin and lightweight, but very sturdy. I love the huge mirror–this would be great for travel, or even just doing your makeup away from a bathroom mirror or vanity, as is often the case for me, since you can easily see your whole face, not just your eyes. If you’re like me and use (and love) mostly drugstore makeup, this palette will stop you in your tracks. 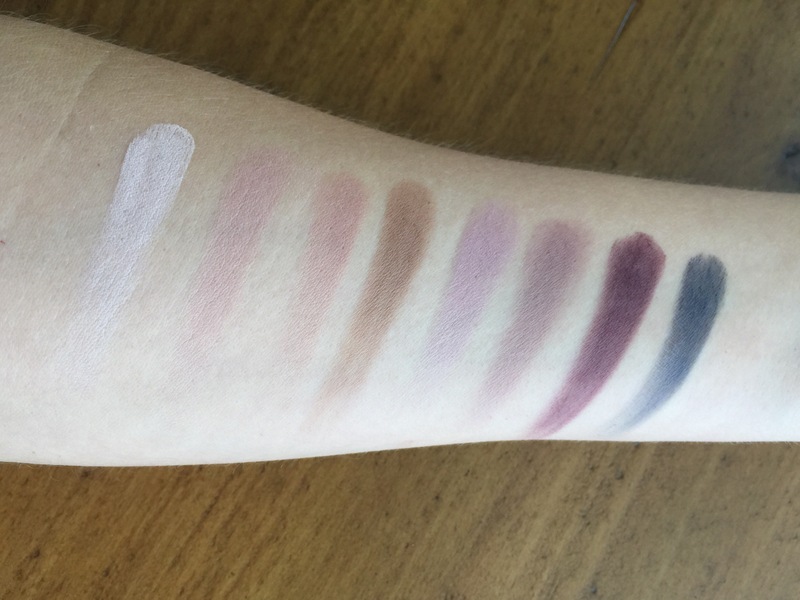 When I went to test the shades, I could simply tap my finger in the shadow and come up with a beautiful, opaque, fully-pigmented swatch. There was nothing chalky or stiff about them, no going back to deepen the swatch or blowing away chunky glitter or powder. They are so consistently formulated; every shadow just glided on my arm like silk. They do kick up some powder when picking them up with a brush, however, so either do your eye makeup before foundation or just brush it away when you’re through. This doesn’t mean I’m going to give up drugstore shadows–not by a long shot–but I do think that it’s always worth it to test different formulas, even just by swatching in store, to get a sense of how various products and brands work and what you like and don’t like. I think what drew me to this palette was that while it has a lot of neutrals, they are interesting neutrals, not just your basic creams and taupes. But it wasn’t just another rose gold palette either. 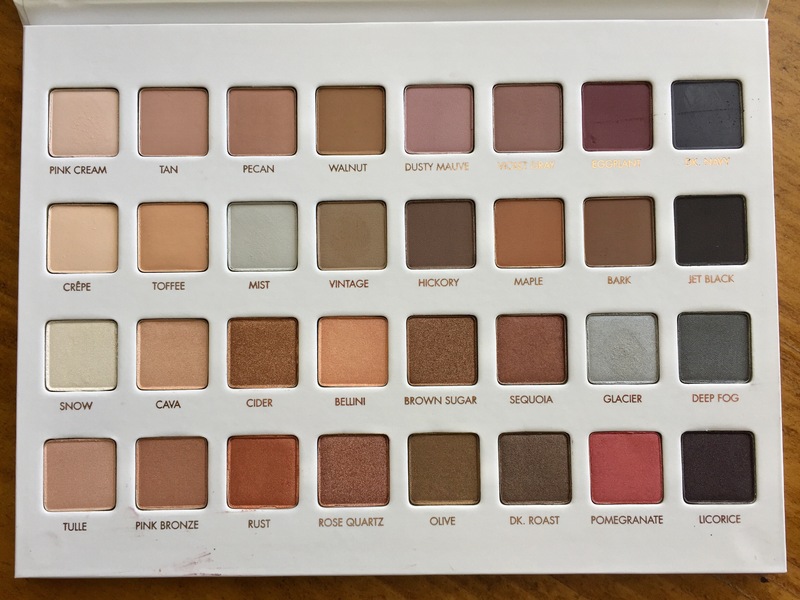 There are more deep shades than in some of the previous Lorac palettes, and there is a good mixture of warm and cool shades. It had some icy blues that I know I don’t have anywhere else in my collection, and the dusty rose shades in the first row are so on trend this fall. Cava, Cider, and Bellini pulled me in from the first moment I saw this palette on Instagram, and who can resist that bright berry shade, Pomegranate? It could have been released in any season and I would have believed it was made for that season. I can look at it now and think, “What a great fall palette!” But it could also look both icy and warm for winter, bright and fresh for spring, and bronze and smoldering for summer. It just could not be more perfectly thought out. So in the end, I could not be more satisfied with my first Lorac purchase. It is already my favorite palette to look at, and I cannot wait to try it on my eyes. (Just need to get rid of this headcold first.) If you have been wanting to try Lorac shadows and were just waiting for the right moment, that moment may have arrived. I highly recommend this palette. Everything about it just makes me happy. And that’s really all I can ask from a palette. I keep going to order it, then I look in my beauty room and then I think, but do I need it? This post convinced me that I do lol.